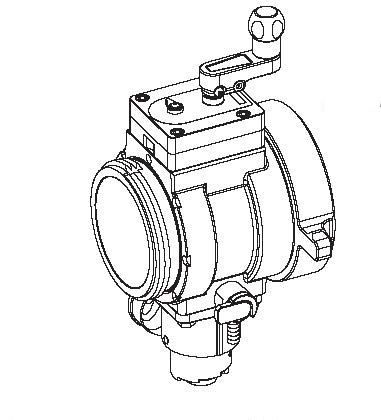 ABS Series – TFT’s Ball Intake Valve has a 3.65” waterway and is designed for use with 4, 5 or 6 inch (100, 125, or 150mm) hose. The compact design without swiveling inlet elbow allows use in limited space, such as behind compartment doors. Designed for pressure or vacuum service on a pumper. Maximum operating pressure is 300 psi (20 bar). Meets 900 psi hydrostatic strength test. The aluminum casting is hardcoat anodized, and TFT powder coated inside and out for maximum corrosion protection. All components on the wet side of the valve are made of stainless steel for additional corrosion protection. Meets NFPA slow-close requirements. The Ball Intake Valves allow for multiple control configurations, with reversible side handwheel as well as a top mounted control to allow ease of use on all apparatus pump panel designs. Valve position indicator is standard. The unit comes equipped with a rugged 3/4 inch (19mm) drain valve to quickly drain water from the valve housing. 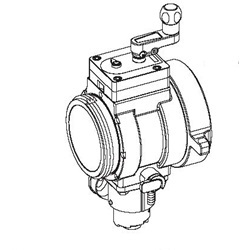 A port for an option air bleed valve is incorporated win the design for user friendly configurability. Hose couplings and truck connections are attached to the valve using polymer bearing rings which provide electrical isolation to help prevent galvanic corrosion. Automatic fast reacting pressure relief valve is easily set without special tools and protects from over pressurization of the hose lines and appliance. Contact TFT customer service for configurations not shown. Cap lanyard anchor point is standard. Storz models available with rigid of full time swivel. Also available with rocker lug or long handle NH inlets and outlets.